Sitting second overall in the Arizona Fall League standings, the Salt River Rafters know they have the bat of towering backstop Grayson Greiner to thank for a good deal of their success. The 6'6 South Caroline alum has posted a pair of starts each week through the first two weeks for the Rafters, three behind the dish and one as the designated hitter. Greiner has yet to disappoint for the Rafters, hitting in all four of his starts, including punching a double in three of the four outings. During the regular season, Greiner posted 15 doubles between the three clubs he suited up with over 91 games. Four games in and Greiner is already a fifth of the way to matching his regular season pace. For Greiner, it was a case of learning from the struggles he faced during the 2015 season with some strategic adjustments. "I revamped my swing in the offseason before 2016 by adding a leg kick and changing my stance," Greiner shared. "I had Lasik eye surgery in the offseason that helped a ton, just having much more confidence at the plate I'd say." Closing out Week Two in Arizona, it's been business as usual for JaCoby Jones. Now seven games deep for the Rafters, Jones has become a staple in the outfield, a location Jones himself has said he enjoys the most when it comes to his placement defensively. At the plate, JaCoby is, well, doing what JaCoby has been known to do and that's produce. Over the course of the second week of play with Salt River, Jones has not gone without a hit over his four starts, posting two-hit outings in two of those four, including a pair of doubles. Alongside Tigers representative partner, Grayson Greiner, Jones is holding a team-third highest in both batting average (.417) and slugging percentage (.667). The red-hot power behind the bat of Christin Stewart that became a regular talking point during the regular season between High-A Lakeland and Double-A Erie has had difficulty adjusting to the Arizona assignment. For some, this may be a concern, but Stewart's history of eventual adaptation to his new surroundings should ease that fear. The leftfielder took the field for a trio of starts in Week Two for Salt River, gathering a pair of hits to conclude at 2-for-11 on the week. One of the largest stumbling blocks for Stewart has surfaced in a team-second 10 strikeouts for a 40% K-rate overall since arriving in Arizona. It's going to take some time, but Stewart should discover his footing before too long and that 30 home run season will once again become a topic of conversation. The monitored recovery pace for Spencer Turnbull has continued into Week Two with Salt River, handing the ball to the big right-hander for his second overall start since arriving in Arizona. As in his first start, Turnbull submitted another three-inning outing for the Rafters, this time taking a bit more of a beating than in his debut. Turnbull was forced to 23 pitches per inning, allowing three runs off four hits, while walking three and fanning four. Just as Salt River was hoping, Vanderbilt alum Adam Ravenelle has been the picture of consistency over the course of his four appearances from the bullpen over the first two weeks of play. Holding to an inning per appearance, Ravenelle didn't allow his first hit until Friday, holding the opposition scoreless since first taking the field for the Rafters. The 6'3, 185 pound right-hander overcame a health scare and now appearing to be back on track with a plus fastball in tow. The relief work for Jeff Thompson has continued in small doses with Salt River this season. Thompson made just one appearance in Week Two for the Rafters, working a pair of innings; his longest of the three appearances for Thompson since the start of his Arizona campaign. On Thursday, Thompson allowed a single hit over his two innings of work, allowing a walk and striking out one on the day. Much like Thompson, Artie Lewicki made just one appearance in Week Two for the Rafters, after snagging his first Fall League win during Week One. A regular season starter, Lewicki has seen only relief time for Salt River, working a trio of outings between the two weeks of play. In his two-inning night on Thursday, Lewicki allowed one run off two hits, walking one and unable to post a strikeout. · Steven Moya is still reportedly in talks with the Toros del Este in the Dominican Republic to discuss his chances of playing ball this winter in his native country. Moya originally said he would bypass Winterball to be with his wife who is expecting a baby. 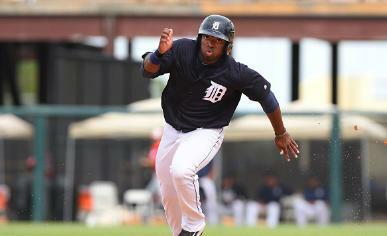 · Tigers infielder Erick Aybar is expected to join his hometown team the Tigres del Licey in mid-November.